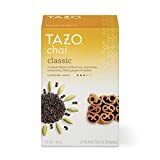 Tazo offers a large range of teas, and are well-known from their pairing with coffee house Starbucks. In terms of caffeine content Tazo teas are no different from any other brewed tea. Caffeine amounts in tea will vary depending on growing and harvesting conditions. Tazo use the USDA nutrition database when quoting their caffeine levels (47mg caffeine per 8oz of brewed tea). Simple pour boiling water over tea, infuse for 45 seconds, pour off the water and brew a second time. Regarding Tazo Chai - this is a combination of Black Tea and a number of spices (see ingredients listed below). There is also a de-caffeinated version of Tazo Chai. Black teas, Cardamom, Cinnamon, Ginger Root, Black Pepper, Cloves, Natural Flavors, Star Anise. 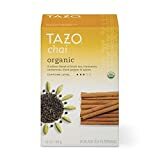 How Does Tazo Chai Compare? Tazo Chai contains 5.88 mgs of caffeine per fluid ounce (19.87mg/100 ml).